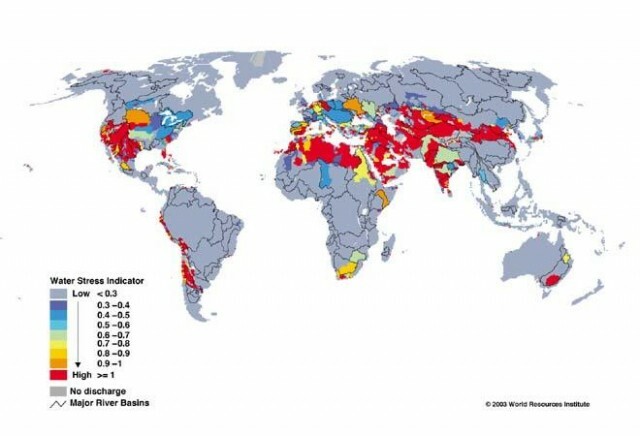 Water is increasingly being viewed as the next “oil” from an economic perspective. The amount of water on earth is fixed, the population is rising, and in some locations consuming more water than is replenished by nature. In fact, in some areas geologically locked water (does not replenish) is being extracted with drilled wells – when it’s gone, it’s gone from the location. The relative “water wealth” of countries is likely to redistribute economic wealth over the long-term in a way similar to the way the relative “oil wealth” has done. Farming is the most inefficient use of water, industrial next and household least. One source in The Futurist magazine said farming accounts for over 70% of all water use. Efficiency improvements in agricultural use of water could extend the horizon for water problems. For example, instead of spraying water into the air with sprinklers, drip systems result in less evaporation. Grains as final foods require less water than meats which are grown on grains. Developing economies tend to move from high grain / low meat diets to more meat consumption, which increases local water requirements. Biofuels use more water in their creation than fossil fuels. Some forms of fossil fuel extraction are more water intensive than others. 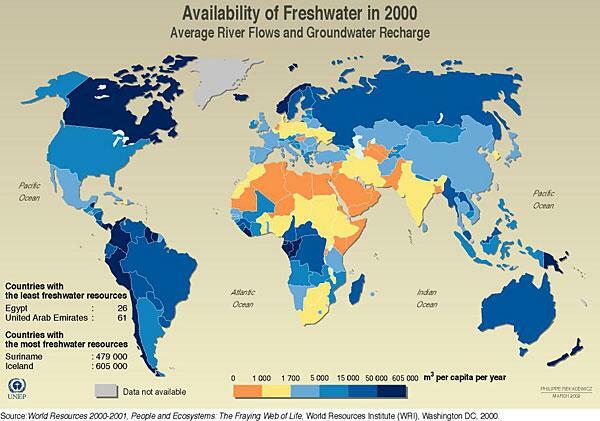 There will be substantial investment implications relating to water over the next 10 or more years. However, it is very difficult to invest directly in water, but there are ways to invest indirectly. Agricultural land investment in water rich, crop exporting countries may be one viable investment path. There are a limited number of such investment opportunities, but they are expanding and are likely to do so further. This entry was posted on Friday, March 30th, 2012 at 10:09 AM and is filed under Interesting Charts. You can follow any responses to this entry through the RSS 2.0 feed. Both comments and pings are currently closed.